An unflinching comedy about why women choose motherhood, why they revere it, fear it, and why some women choose to forgo it. Over the course of one explosive evening, two couples and a surrogate must face their own ridiculous and sometimes heartbreaking shortcomings. With sharp cutting dialogue and complicated characters, EGG is about the personal, social, professional, and ideological implications of bringing new life into the world. 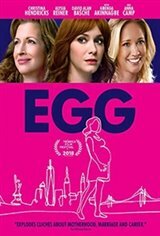 Artist Tina (Alysia Reiner, and her passive-aggressive feminist husband invite her eight-months pregnant art school rival and power hungry, new-money husband (David Alan Basche, The Exes) to their Brooklyn loft, surprising them with Tina's new work-in-progress: a radical alternative to motherhood. But when their sensuous, non-traditional surrogate arrives (Anna Camp, Pitch Perfect) the truth comes out, and the patriarchy fights to hang on by its teeth.